I am a postdoctoral fellow working with Dr. Katy Heath (University of Illinois) and Dr. Posy Busby (Oregon State University). I am broadly interested in the community ecology of plant microbiomes, and am currently working to understand how interactions between aboveground and belowground plant symbionts affect host productivity and pathogen defense. March 2019 - Enjoyed visiting Panama to work on a manuscript and give a Tupper Talk at STRI! January 2019 - "Foliar endophytic fungi alter patterns of nitrogen uptake and distribution in Theobroma cacao" is now available online as an accepted article at New Phytologist! August 2018 - Had a fantastic time at ESA 2018 in New Orleans! 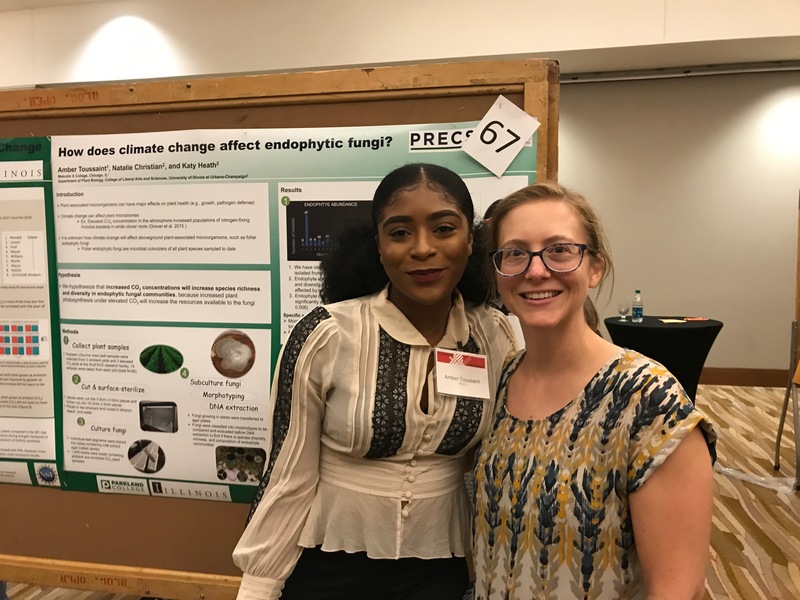 July 2018 - Undergraduate mentee Amber Toussaint capped off a successful summer research experience by presenting her poster "How does climate change affect endophytic fungi?" Way to go, Amber! July 2018 - I presented the Fun^Fun Traits Database at the International Mycological Congress in Puerto Rico. February 2018 - I have officially started my postdoc at the University of Illinois with Katy Heath, co-advised by Posy Busby at Oregon State. I am funded by a USDA Postdoctoral Fellowship, and excited to investigate interactions between aboveground and belowground plant microbes! December 2017 - I successfully defended my dissertation! August 2017 - Went to ESA in Portland, OR, and had some great conversations about endophytes and chemical ecology! Special thanks to the ESA Microbial Ecology Section for awarding me a student travel grant. July 2017 - Presented my cacao research at ATBC in Mérida, Mexico (and had some great food!!). July 2017 - Just published "Exposure to the leaf litter microbiome of healthy adults protects seedlings from pathogen damage" in Proceedings of the Royal Society B! I got the chance to talk with CBC Radio's Quirks and Quarks about this study - listen to the podcast here. May 2017 - Back to Panama for a month to collect some more data! April 2017 - So honored to receive the Indiana University Albert Ruesink Outstanding Associate Instructor Teaching Award in Biology. March 2017 - Traveled back to Santa Barbara to continue working with the NCEAS Fungal Traits working group! We are making a lot of progress on a couple of exciting projects! February 2017 - My colleagues and I contributed a chapter to the 4th edition of The Fungal Community, which was recently published! October 2016 - Quick trip back to Panama to attend and present at the Smithsonian Tropical Research Institute's Microbial Ecology Symposium! August 2016 - Lots of travel this month! I presented my research at the ESA meeting in Ft. Lauderdale, and then traveled straight to Santa Barbara to participate in a fungal traits working group at NCEAS! June 2016 - The first chapter of my dissertation was published in Microbial Ecology! Read it here. February 2016 - I found out that my DDIG proposal was recommended for funding!! February 2016 - I traveled to Gamboa, Panama to do the experiments associated with one of my dissertation chapters. August 2015 - I attended and presented at ESA’s Centennial Meeting in Baltimore, MD. Check out the abstract here. August 2015 - My colleagues and I had review paper published in Frontiers in Microbiology!! You can read “Microbiomes: unifying animal and plant systems through the lens of community ecology theory” here. August 2015 - I was awarded an NSF GRIP (Graduate Research Internship Program) award to continue my research in collaboration with Allen Herre and Luis Mejia at the Smithsonian Tropical Institute. May 2015 - My undergraduate mentee Courtney Sullivan successfully defended her senior honors thesis on fungal endophytes in White Snakeroot!! Her work was also recognized with several grants and awards through the Biology Department and the Hutton Honors College. I am so proud of you, Coco! Good luck in Atlanta!! April 2015 - I defended my dissertation proposal and have advanced to candidacy! I am broadly interested in community dynamics of plant-associated fungi, both aboveground and belowground. In particular, I am interested in the community assembly and functional implications of foliar endophytic fungi. I am passionate about education, and take a multi-pronged approach to my pedagogical pursuits, including not only teaching and mentoring, but also formal pedagogy training and classroom research. I have combined my interests in nature and education by conducting outreach that focuses on restoring healthy forests and reconnecting the community with their woodlands.